As per the Business Wire, the global retail sector is estimated to have achieved revenues of US$ 22.6 trillion in 2015 and should continue to rise to US$ 28 trillion by 2019, with average annual growth rate of 3.8% since 2008. This indicates the quantum of opportunities that are present in this sector which marketers can surely gain from. If you are one of those marketers planning to run focused marketing campaigns in the Retail Industry. Blue Mail Media’s highly accurate and reliable Database of Retail Business Executives can aid you in connecting with key decision makers, C-Level Executives, and professionals from the retail industry. Our Retail Industry Executives list effectively caters to marketers in their multi-channel marketing campaigns. Our database gives you complete information to reach out to your target prospects via telephone, email or mail. Blue Mail Media has successfully helped numerous organizations in executing their multi-channel marketing campaigns with a powerful data backup. Organizations see a visible growth in terms of customer interactions, conversions and ROI. Our proficient team data specialists leave no stone unturned in making sure that our Retail Industry Email Database meets the highest quality standards, and helps you achieve greater returns on your marketing investments. 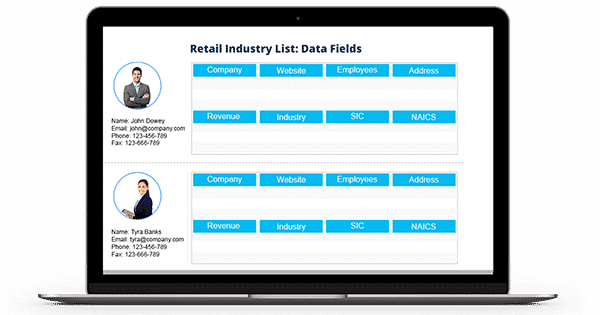 Our clients can choose from our pre-packaged Retail Industry Executives Mailing List or they can avail a customized database that aligns perfectly with their marketing objectives. We meticulously collect data from reliable sources, verify it for accuracy and update the same on a timely basis to ensure our database remains up-to-date at all times. Blue Mail Media can actively support you irrespective of the region you operate in due to our strong data partner network across UK, USA, Canada, Europe, North America, APAC and other regions.